Frugal Retirement Living which lifestyle will you choose? Retirement is the payoff for all your hard work, you have earned it and deserve it...Read on and retire. This site is devoted to folks who would rather retire than continue to work... I would think that would include most everyone. This is not advice that you will get from a financial planner. Let's get started...but first take a look at the left column of the page...the couple on the stern of a sailboat...you too can as happy as they look...I know...it's a picture of yours truly and his soulmate since 1975. I am currently 73 and we had been retired for 25 years, we would not trade our retirement years and experiences for any amount of money... We learned long ago the futility of swapping time working for dollars...it is not worth it folks. 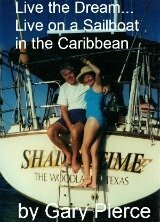 Take another look at the couple on the stern of their sailboat Shadowtime...somewhere in the Caribbean... And tell me they miss the office. It is 2019, and some folks wanting to retire just think they cannot retire...we are here to help you realize you can if you choose low cost ways of living. We are not hippies, daredevils or anyone out of the ordinary... We would rather be retired on less than working to acquire more retirement dollars. We will show you why you should retire as soon as possible... or we will at least make you think twice. One of the saddest things that I hear is... that I cannot afford to retire . You should not say that until you have investigated all lifestyles that cost less to enjoy. We can introduce you to the frugal retirement living lifestyles that we have enjoyed, you will discover that they are painless, safe, practical and frugal. Have you considered these frugal lifestyles? None of these options are cheap living, they are just living cheaply... There is a big difference between the two phrases... one involves sacrifice the other embraces retirement. If you would just like to learn methods on how to save money, you have come to the right site. We have dozens of real life practical methods to save whether you are ready to retire now or later. With 25 years of frugal retirement living experience you do not have to learn by trial and error you can get your answers here. Come inside and let us tell you how we have enjoyed and continue to enjoy our retirement years.